There’s something about being married. All your furniture has to match. It’s like you instantly grow up or something. J and I have lived together for a couple years and just merged the best of our furniture when we moved in. Most of her stuff won out, but I got my ugly, comfy chair. Over the last two years, we’ve slowly started buying stuff together. Since the wedding and moving to Kalamazoo, there’s seemed to be more of an urgency to get nicer stuff. The first item was a couch which was desperately needed. After the couch, we got ottoman’s to replace the end tables turned coffee tables J made during the whole Trading Spaces craze. The coffee tables returned to their former lives as end tables, but they were huge and didn’t match anything, so last night while we checked out Kmart’s going out of business sale, we found an end table that perfectly matched our kitchen table (also purchased from K-Mart a few years ago), ottoman’s, and couch. Today, I was left with the chore of getting rid of the old end tables. J suggested I take them to Goodwill since we had a couple bags that needed to go anyway. Since I was leaving the house, I figured I’d just stop somewhere for a quick meal. I’ve been curious about Taco Bob’s and I thought there was one on my way to Goodwill. I’m not sure where I actually thought Goodwill is, but when I put it in my GPS, it took me the opposite way of where I thought it was. I was thinking it was more out by the airport, but it was actually in Portage just off Westnedge. Still, I had Taco Bob’s on the brain and didn’t feel like going in the mall, so I headed back to the Milwood neighborhood. Taco Bob’s is a small regional chain with ten stores between Kalamazoo and Grand Rapids. There are three stores in Kalamazoo and two in Portage. The shop I chose is in a strip mall on the corner of Portage Road and Dorchester Avenue. If you’d rather do the stay in your car thing, there is a drive thru behind the building, but I parked my car out front and went inside. The layout is a pretty typical fast food set up. Order counter is in the back of the space. Tables occupy the front. The menu board is above the cash register. Since I had never been in a Taco Bob’s before, I tried to take my time and see all they had to offer. While I was looking it over, the cashier was talking to me about specials. They didn’t really hav a special that interested me, so I just shook my head and kept reading. When I go to Taco Bell, I just order multiple hard shell tacos. While I like Mexican flavors, I’m not a fan of the sides traditionally offered with Mexican food. A la carte tacos at Taco Bob’s were $1.50 each, so it would have made financial sense to order my typical five tacos. I decided to give one of the combos a try. I should have read the menu a little closer. They have an item called a “Funny Taco” which is a hard shell taco wrapped in a softshell. It’s held together with nacho cheese. They also have a “Walking Taco.” I’ve seen these at the Breslin Center in East Lansing. It’s actually a really cool idea. It’s like a taco in a cup. I could do without the sour cream and tomatoes, but it’s still a cool idea. I ended up ordering the #1 Combo which is two tacos, pinto beans, spanish rice, tortilla chips, and a pop. You do get your choice of hard or softshell tacos. I chose hard shell. The cashier also offered me a choice in salsa, I chose hot, and jalapenos on the side, which I also took. The total was a little over six bucks and by the time I paid, my order was ready. I grabbed the bag and headed home to dig in. The tacos were really good. The shell’s had a pretty good salty taste to them and they were lighter than most crispy taco shells….almost like they were homemade? I tried the Spanish rice and while it was fine, it’s not my thing. I ate a few bites, but didn’t finish it. I’m totally turned off by the look of beans, so I couldn’t even bring myself to try it. That’s just a personal preference…not a slam on the beans. The chips were really good. Now these really tasted homemade. They’re white corn chips with just a little salt. 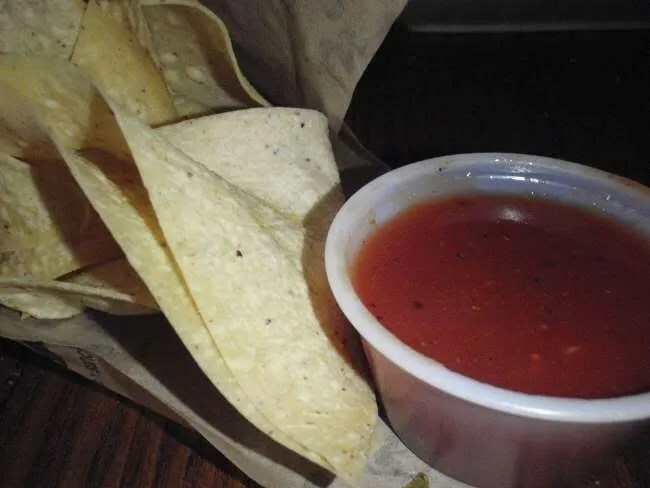 The salsa had more of a soupy consistency to it. A year ago, I would have preferred this, but I’ve learned to love chunky salsa. It wasn’t super hot, but did have a little bit of spice. It wasn’t so much that I had to go running for a glass of milk, but it was spicy enough that I could taste it. So, I’m a fan of Taco Bob’s. I like authentic Mexican cuisine, but every now and then I crave tacos. Usually that has me running for the border, but I may have to rethink that. Tacos are authentic Mexican food, but those hard-shelled tacos served @ Bob’s are certainly not. 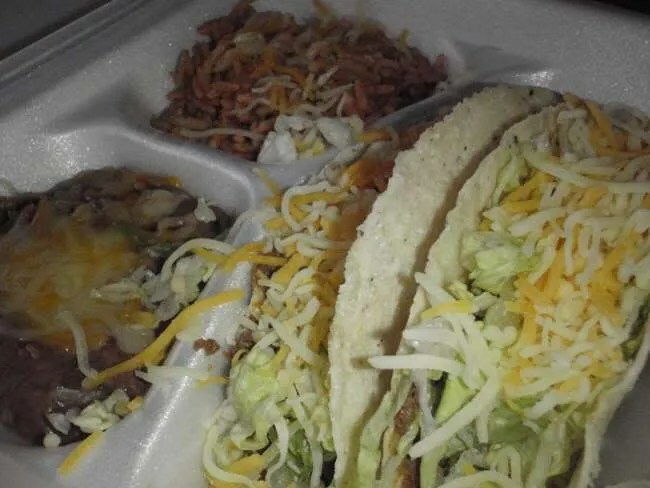 What kind of gringo tacos are those, topped with cheese (and cheddar, too) and lettuce? Great tacos should be served primarily with handmade corn tortillas, divided into categories by protein, such as carne asada, pastor (served a la trompa), fish, carnitas, etc. But most tacos are garnished with simple toppings such as diced white onion, cilantro & salsa verde, or cabbage. No tomatoes either. I never said they were and not being authentic is not automatically a bad thing. I really like authentic tacos, but I also like the Americanized fusion version that is widely popular in this country. Tacos are no different than pizza. The pizza we’re familiar with is not authentic to anywhere in Italy even though we associate it with being from that country. That doesn’t mean what we call pizza is bad compared to what the Italians call pizza. It’s just different. I don’t recall anyone saying that Taco Bob’s is “real mexican food.” I think if they were looking to fulfill the “real mexican” taste and idea, they would have named it something like “Taco Juan’s.” If I want authentic mexican, I’ll go to Los Amigos. Taco Bob’s is great food, period. I love the funny tacos and love the wet burrito. And by the way, if you want phoney mexican food that I guess has adopted the name “tex-mex” go to Q-Doba…actually don’t cuz its a waste of money and calories. I hear what you’re saying about pizza and the implication that you can have good American-style pizza, but I don’t think there is a uniform cuisine called American-style Mexican, and in any case, what usually passes for gringo-Mexican is an abomination — bad ingredients, bad preparation, etc. The only thing that approximates an Americanized Mexican cuisine is Tex-Mex, which really is a cuisine unto itself and departs significantly from Mexican. Anyway, if given the choice, I’d take an authentic Mexican taco anyday over the mass, commercialized Ortega/Taco Hell version. It is what it is. It’s no different than what passes for a hamburger at McDonald’s. Would I rather have a fresh ground patty with real cheddar cheese on a ciabatta roll? Of course I would….but that takes time and is gonna cost more. Sometimes, I just want that McDonald’s burger…same thing with cheap tacos. Sometimes, I just don’t want the hassle of sitting down and having someone wait on me. Where would you recommend to go for good mexican in this town? I tried Las Juanitas but it just didn’t seem to gel for me. 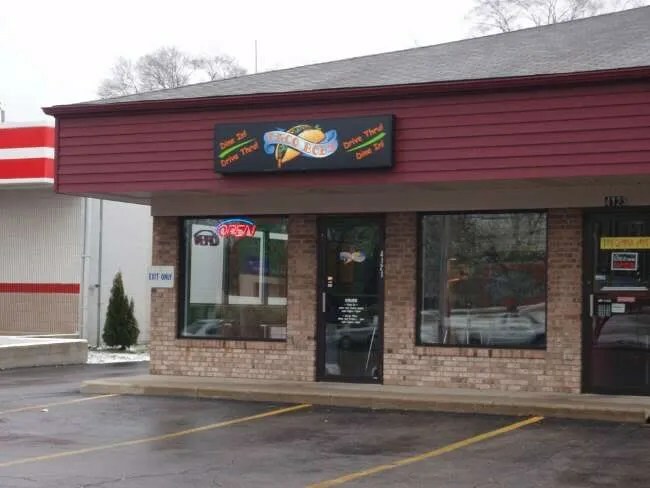 I had a bad experience at Taco Bob’s on Westnedge and Vine, but maybe will give it another try, as I’ve heard a lot of good things about the Funny Taco. I could definitely use some recs on Mexican food. The only place we’ve tried is Pappy’s and I didn’t really think that was too Mexican. Would love to find a couple good places. Funny tacos from Taco Bob’s are amazing! Even if they are cheap and not “real mexican quisine”. Try Mi Ranchito in Oshtemo. On 9th street, near the Stadium Dr. intersection. 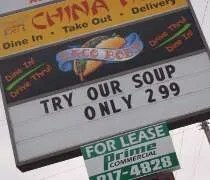 That’s where I always go for real mexican food. My boyfriend would suggest the chimmi chunga. I always go for the chicken flauta, and it NEVER dissapoints. Hmm… Last I remembered, I don’t think Mi Ranchito is overly authentic. benn a long time, though.